I am digging through these "Beatles Rule" fan club newsletter and finding some great stories. The print on these newsletters is often smeared and hard to read, so I feel like by putting them on MTBFR, I am breathing new life into these stories. This story was written by Mary Ann L. and is from the November/December 1969 issue. On the night of March 27th (1969) we got to meet Paul as he was returning from his in-laws. There were only a few of us there as he and Linda came back to her apartment. 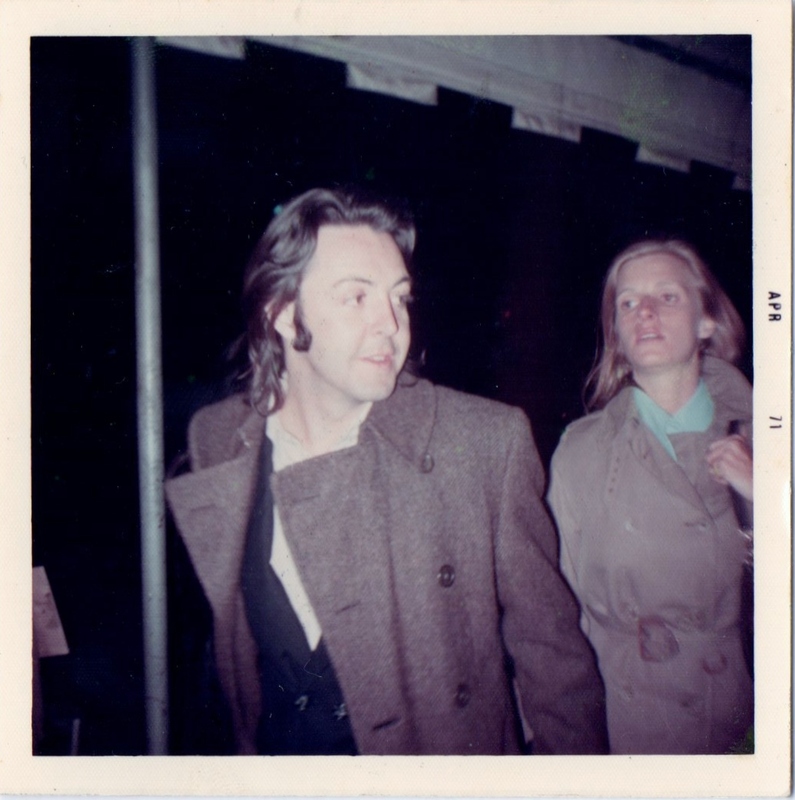 Paul was wearing his long midi coat and Linda, her perpetual trench coat. Paul was a bit tipsy and red-eyed. 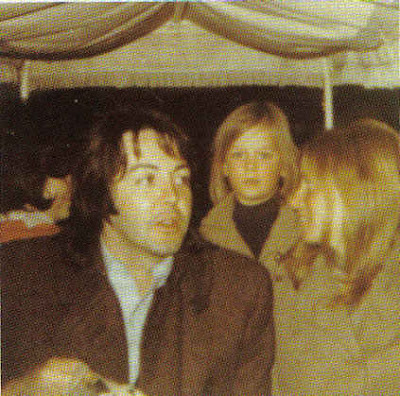 My girlfriend, Carol, handed Paul some pictures of Mary Hopkin. He looked at them and handed them back to her, but Carol wanted him to keep them. Paul said, "what do you want from me...a sacrilege?" Carol said "yes" and Paul started laughing and going "o.k., o.k., I'll give you a sacrilege." With that, he stuck the pixs in his pocket. Linda started complaining about the flashes, although there weren't that many, but Linda got annoyed. She started saying, "No more, no more," and told Paul to make us stop. Paul took her arm and placed it around his stomach and Linda had her head buried in his shoulder. We started patting her and telling her not to worry -- everything was o.k. Standing there and seeing a thing like that really made your heart break. while Paul was talking with someone Carold said to Linda (low so that Paul wouldn't hear), "Thank you so much for making him happy." But Paul heard it and turned and let out a bit, "ahh!" After they got into the elevator, Paul turned and waved to us all. On March 28 (Friday) there were only a few of us there again. Linda came out about 10 o'clock by herself. She had on her trench coat, a lavender blouse, a blue sweater, a red skirt and camel knee-socks. 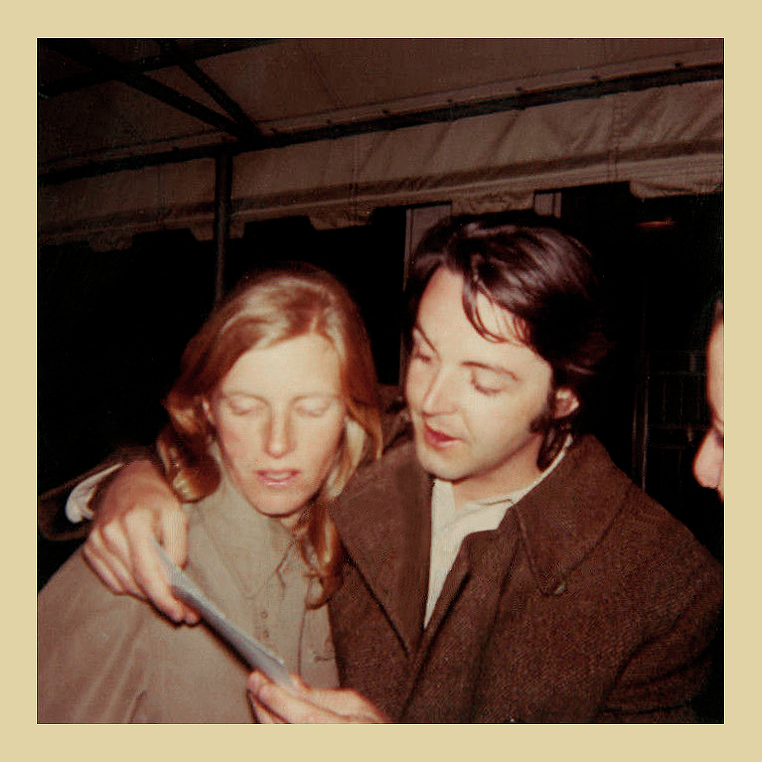 while we were talking to her, we asked her what it was like being married to Paul. She said that now that's she's married she has to do the dirty-work like going to the store and calling the dentist (Laster she went across the street to a phone booth, where she probably called him). She showed us her ring. It's a plain gold band -- and a couple sizes too big. Carol said she better watch it, or she will lose it. Linda said if she lost it she could get another one. She was looking at some of our pictures of Paul, and when she came to the ones of Paul and John in New York in May 1968, she remarked that she was there then and she did the same when she saw the ones of Paul in L.A. in June of 1968. She told us the fans in London were absolutely impossible. Carol and I asked her about a crystal vase we had brought as a wedding gift for them and had left with Linda's mother. She said they had gotten it and it was upstairs and they liked it and thanks. Then she left. Awhile afterward the doorman came out to tell us that Paul and Heather were upstairs watching T.V. Paul had Heather on his lap and had his shoes off and feet up. Awhile later as we looked up we saw Paul and Heather hanging out the window. About half hour after Linda came back all three of them came out. Paul looked beautiful wearing a dark suit and a brownish shirt. We have him a bottle of wine, an Easter basket for Heather. Paul went back to ask the doorman to watch them. Linda was holding a turtle tank with two of Heather's turtles in it. Heather told us (in her new London accent) that she had to give them away because she was moving to London. Paul stood beside her the whole time. Alfie (who loves George) kept asking Paul how he was (after being busted), and Paul kept saying he would be all right, but he didn't know anything else because he hadn't been in London for a while. then he said that all he did know was about Eisenhower dying (He had died a little while before). With that, they went up the block to get a cab. Paul held Heather's hand and skipped to the corner with her. March 31st (Monday) Paul, Linda and Heather came out about nine to leave for the airport. Linda seemed to be in a good mood. She was probably glad to be leaving. We had our own marathon race chasing their limo to the airport but lost it after a while. We went straight to BOAC when we got there -- but no Paul. After looking around for a while I went to the TWA building by myself. The first thing I saw when I walked in the door was that man in his long coat. I died. I was petrified by myself and wanted to turn back and get the others, but I'd probably miss him by that time. No one in the building realized who it was and no one bothered him. Paul was in a great mood, whistling and humming all the time. A small TWA bus came up to them to drive them to the plane. As they were getting in it I asked Paul if he would mind if I took a pic. SHe said, "Sure! Take a picture of us on the TWA bus." So I did and I thanked him, then I got up all my courage and asked Paul if I could kiss him goodbye. he said, "Yes, please." Die. I really started to shake and Paul told me to stop shaking! Paul, Linda, and Heather all waved as they left. When I read these stories, I am reminded of William Shatner's famous "Get a life!" quip. But Shatner, Nimoy, Doohan, Nichols, and Takei didn't have to contend with people constantly lurking around their homes. I'm glad that most of the US states have enacted stalking laws. Yes, that's true but why hang out the window to encourage it. I find Linda exasperating. She knew what she was getting into. If Paul wanted to talk to his fans, let him, if he didn't then let him deal with it. 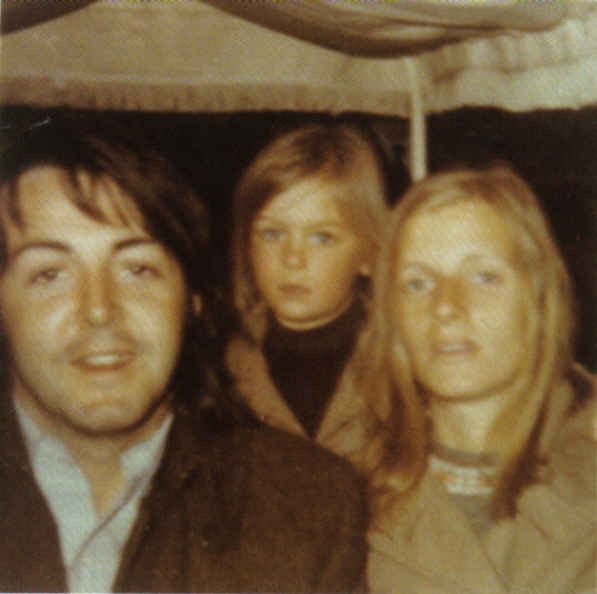 I feel such pity for Linda and Paul's daughter Heather. It's hard enough growing up in normal circumstances but she went through so much upheaval and weirdness during the late 1960s and early 1970s. I wish her peace and happiness in her life. I agree. This little girl never looked very happy amidst all the turmoil. I also wonder how young Beatrice is faring - being a generation apart from the other Beatles' children she is very much on her own. I hope the others look out for her.